Although I am just a little Shih Tzu, one of my hobbies is to find you the cutest puppy pictures ever. Plus, I like to scope out my competition and look even cuter. I introduce you a future “American Gentleman” (one of the nicknames of the Boston Terrier). He is stretching – one of my favorite habits, after I wake up from a nice nap. Boston Terriers are a non-sporting breed, small and compact with erect, very distinguished ears. This friendly dog is considered a brachycephalic breed – which means they are short snouted. Like me. Or as Mama likes to call me “mushed” face. Can you believe that this Mr. Coren says that Shih Tzus are 70th out of 79 in Smartest … So he thinks we are dumb! I am seriously insulted by this. As EVERYONE should know, we Shih Tzu are smart… Just because we have our own personalities and don’t always listen to exactly what YOU humans say. We are SMART. We are like humans – we make our own decisions, and if we don’t feel like doing your stupid command, we won’t! 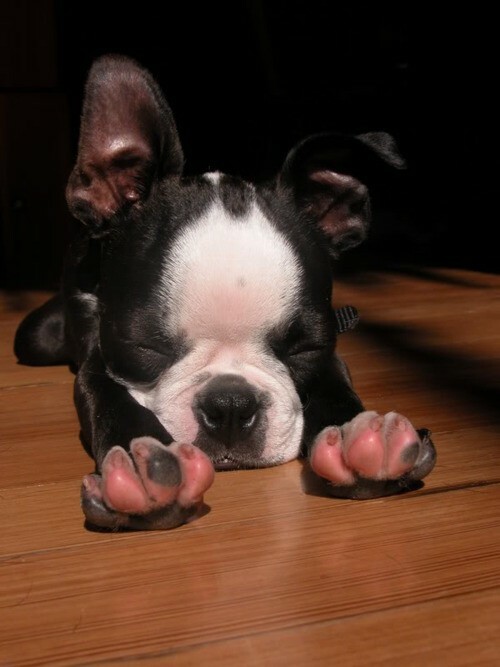 But despite the “so-called” smarter than Shih Tzu, I think Boston Terrier puppies are the cutest ever. Not as cute as Shih Tzu, but don’t you just want to give this little fella a kiss on his forehead? « Shame on Mama – She Forgot My Outfit for the Vietnamese New Year!